Considering the scale of recent examples of corporate malfeasance, at first glance Mark Hurd’s indiscretions pale in comparison. Mr. Hurd was forced to resign from Hewlett Packard last Friday after a sexual harassment allegation failed to reveal a violation of the company’s sexual harassment policy but brought to light other questionable patterns of behavior. Specifically, Mr. Hurd’s relationship with a marketing contractor involved $20,000 of expenses associated with travel, restaurant meals, and questions regarding whether services were actually rendered by the contractor. For most people, $20,000 qualifies as a substantial amount of money, but the figure is not even a rounding error when it comes to HP’s financial results or Mr. Hurd’s compensation level. Furthermore, Mr. Hurd is widely credited for engineering a major turnaround at the company after Carly Fiorina’s controversial tenure as CEO. In terms of financial results and share price performance over the past five years, it seems clear that Mr. Hurd delivered for HP shareholders. Given the fact that HP does not appear to have clear succession plans in place, forcing Mr. Hurd to resign has been controversial. One of the key principles of effective corporate governance is that there must be a zero tolerance policy for any financial or ethical malfeasance particularly for executive officers. Does this make sense? To answer this question, one must consider the potential impact of an executive cheating in small matters on the wider culture of the company as well as the propensity for larger scale cheating in the future. While $20,000 of expenses is not material to HP’s results, Mr. Hurd’s actions demonstrate a contempt for shareholders and a propensity to disregard rules and policies that lower level employees are expected to adhere to. It is highly unusual for a CEO of a major company to personally interview a relatively low level marketing consultant. Obviously others in the company must have been aware of Mr. Hurd’s unusual interest in the contractor and accountants somewhere in the organization were exposed to the expenses. Even if the action was below the radar for most observers within the company, at least some employees would have been aware of the pattern and taken cues regarding the implications for overall standards of behavior at HP. The other justification for a zero tolerance policy is that someone who cheats in small matters is more likely to engage in wider spread fraud as well. There is no reason to believe that any broader financial irregularities exist at HP, but simply the appearance of this risk is unacceptable and the Board had little choice but to act. Rights to purchase 775,000 shares of outstanding options for HP common stock until September 7. The shares were considered vested at the date of Mr. Hurd’s resignation last week, representing an acceleration of the vesting schedule. Mr. Hurd will receive 330,177 restricted stock units based on his performance from January 17, 2008 until his resignation date. 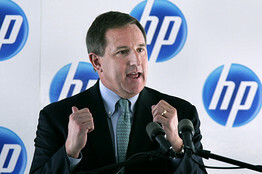 On December 11, 2010, 15,853 additional shares granted to Mr. Hurd in 2009 will be settled at a price equal to or less than the closing price of HP shares last Friday. This type of severance agreement makes a mockery of the rationale behind the Board’s decision and breeds cynicism and resentment among company employees, shareholders, and the general public. The fact that Mr. Hurd produced value for HP shareholders during his tenure is not in dispute and he has already been compensated for this past performance through salary, bonus payments, and already vested and exercised option grants. To accelerate the vesting of additional grants intended to provide incentives for Mr. Hurd in the future seems entirely inappropriate and reveals the cynicism many Boards have regarding the stated intent of using such grants to align shareholder and management interests. The reality is that hefty severance payments like this are not unusual and are used to smooth what could otherwise be an even more acrimonious separation. HP is attempting to put this matter behind the company and move forward without messy litigation. However, the fact remains that the Board failed to stand on principle and terminate Mr. Hurd’s employment “for cause” which would have curtailed his eligibility for severance. What could have been a great example of a Board demonstrating resolve and principle has been significantly diluted by the terms of the severance agreement. Disclosure: No position in Hewlett Packard. When Does News “Syndication” Become Outright Theft?